Often served as a secondo, most Italian restaurants in the U.S. that serve this dish have their own versions of original recipe, tweaking it a little bit here and there to leave their own place’s signature. This is not such an uncommon practice in the culinary world. However, there is a classic way to making Chicken Marsala. First, you coat the chicken with flour and saute or lightly fry it. Then, when the meat is cooked, you set it aside. With a saucepan, you make the sauce, which is a reduction of the Marsala wine with mushrooms, onions, butter, and olive oil. Chicken Marsala is a rich dish that has its roots from the island of Sicily, but has become quite popular in the United States for many years. One of its main ingredients is the Marsala wine, which also comes from Sicily. 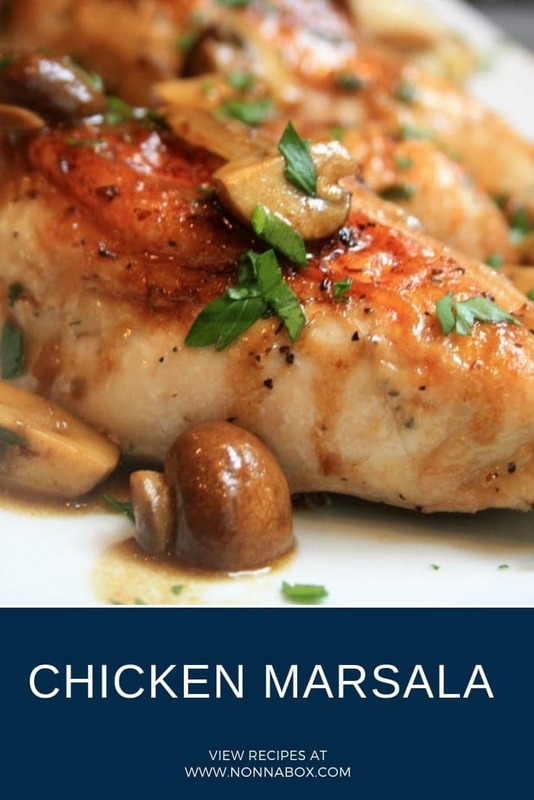 This is the classic method of preparing Chicken Marsala. Essentially, the meat will be lightly friend first before we get to the Marsala reduction sauce. Peel, wash, and finely chop the onion (or shallot). Also chop the sprigs of parsley and crush the garlic. Set these aside. Wash and slice the mushrooms. Set aside. Mix the flour with salt and pepper. Then, slice the chicken into portions, and tenderize each slice. Next, dip each slice in the flour mixture. In pan, put the extra virgin olive oil and fry each slice of breaded chicken breast for four to five minutes. Flip each piece to cook the other side. Cook until the chicken looks golden brown. Set aside. In the same saucepan, sauté the finely chopped onion, the crushed garlic clove, and the mushrooms. After a minute or two, add the bay leaf and sauté until the onion looks golden. Next, over medium heat, add the Marsala wine and let the flavor soak for a minute or two. Finally, add the lightly fried chicken pieces on top of the sauce. Still over medium heat, let the meat soak up the flavor for 6 to 8 minutes. If you prefer a thicker sauce, you can sauté it a few minutes more. Take note that wine may evaporate quicker than other liquids, so be sure not to cook it too long. Place chicken on a serving dish and garnish with chopped parsley. Quite a popular dish in the United States, you can probably find that most Italian restaurants have their own versions of Chicken Marsala in their menu. Even restaurants that do not technically strictly serve Italian cuisine may have this. Why, you ask? Well, it’s because it’s a rich flavorful chicken dish that’s not only a delight to the palate but also quite nutritious. And yes, it’s nutritious. After all, it has chicken in it, and we’ve already mentioned the collection of healthy goodness you can get from this lean meat in one of our previous recipe posts. Can’t recall? Check out our Risotto with Asparagus and Chicken recipe and you’ll find out exactly all the good things chicken meat can bring you and your family… or anyone else you serve these chicken dishes to. Back to the scrumptiousness at hand, let’s find out more about this popular special dish. There is some teeny tiny debate as to its origins. Whether it may be because of its delectably rich flavor or its apparent popularity today, no one’s quite sure. Some say it’s an Italian-American dish brought by English settlers who previously lived in Sicily during the 19th century. Others say it has French origins because the recipe for its sauce can be supposedly traced back to Queen Maria Carolina of Naples and Sicily, who was The French Queen Marie Antoinette’s sister. Others still say that it’s a traditional Sicilian dish since one of its main ingredient is from a Sicilian city. But whichever of the supposed historical accounts may be true, there’s no debate whatsoever that the earliest Chicken Marsala recipe indeed has Sicilian roots. This traditional Italian dish is from the autonomous region of Sicily. Yep, I am indeed referring to the beautiful Mediterranean island where the infamous fictional Vito Corleone comes from. Apparently, Sicily is not just famous for its gorgeous beaches and sparkling blue green waters, but also for its regional food… which should not be much of a surprise since the rest of the country is littered with regions, each with their own delectable regional food. 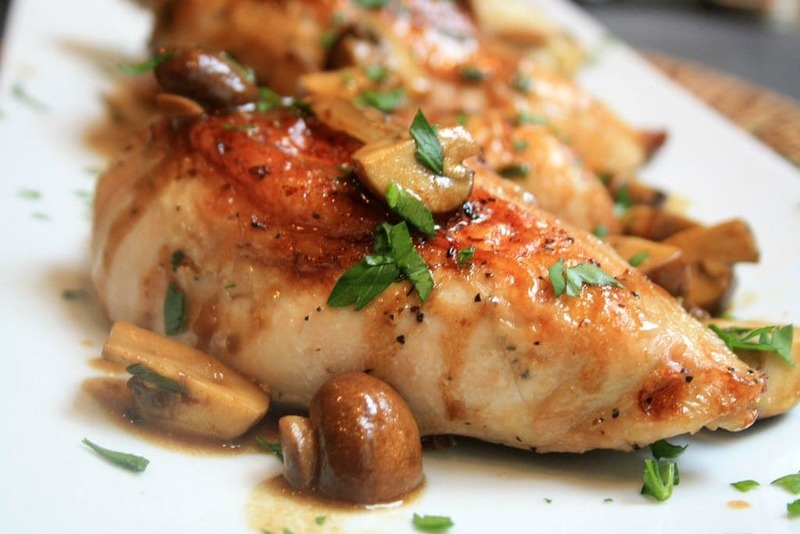 Now, the main ingredients to this Sicilian dish are chicken breast, mushrooms, and of course, Marsala wine. And yes, the presence of this wine is where the dish got its name. Call it a key ingredient, if you will. So what exactly is Marsala wine? Well, it’s a fortified wine that originated in the city of (yep, you got it!) Marsala, which can be found in Sicily, naturally. Now, fortified means that it is mixed with brandy or grape spirits, which means they have a higher alcohol content than most wines. As a matter of fact, Marsala wines contain about 15 to 20% alcohol by volume. In comparison to the popular Chianti, which usually has up to 12% alcohol by volume, Marsala is obviously quite stronger and may get you woozy with half the quantity. Other examples of fortified wines are Sherry, Madeira, and Port. Another thing you should be aware of regarding Marsala wine is that it’s quite unique that it can be paired with the some of the “hard to match” foods such as chocolate, asparagus, and even brussel sprouts. Note: When buying Marsala wine for Chicken Marsala, you should probably only get either of these two: Fine (Fino) or Superior (Superiore). These are the types most appropriate for cooking. Although considered to have Sicilian roots, you will not often find Chicken Marsala in restaurants within the Sicily region. In fact, it is easier to find the dish in Italian restaurants in the U.S. than in Italy. 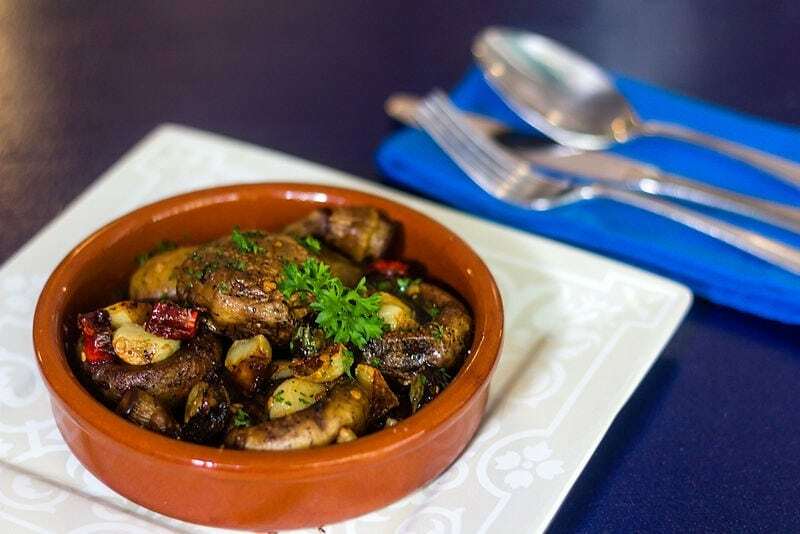 Marsala wine used in this dish is more often served as an aperitif in Italy and is actually considered to be one of the best fortified wines in the European country. In fact, you can probably find it in the wine lists of most restaurants there. Chicken Marsala is believed to be derived from another traditional Sicilian dish called Scaloppine al Marsala, which uses pork loin instead of chicken breast. Popularity of the Marsala wine in America started during the 18th century by an English merchant named John Woodhouse. He loved the Sicilian wine so much that he started a wine making and exporting business. Chicken Marsala may have Arabic influences. How? The town of Marsala was once a major port city after the Roman Empire fell, and it was visited by many Arab traders. They called it “Mars-el-Allah” which means the port of Allah… and obviously it’s where the city’s current name came from. This savory meat dish goes well with a bowl of fresh green salad, or a helping or toasted almonds and roasted carrots. 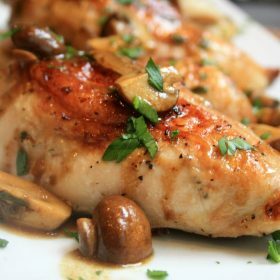 If you’re cooking Chicken Marsala but you can’t get your hands on a bottle, some Madeira wine may be a good substitute for it since they have, more or less, the same taste profile. The wine used in Chicken Marsala is the same one used for traditional Italian desserts such as Tiramisu and Zabaglione.